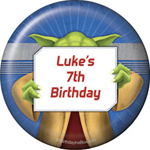 For Star Wars party ideas relating to invitations, food, drink, and food styling please see page one of the Star Wars party theme. 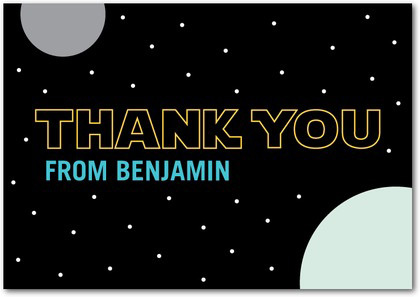 This page, page 2, is a continuation of the Star Wars party theme and deals with ideas for Star Wars party decorations, table styling, costumes and party games. 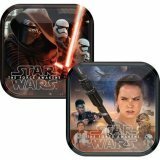 If you're planning a party for kids and just want a simple quick fix to dress the table in keeping with these Star Wars party ideas, there are lots of branded tableware products available including plates, bowls, napkins, cups and tablecloths. 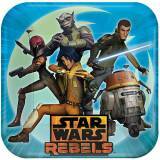 These include options for Star Wars Rebels (select supplier 2) and Star Wars The Force Awakens (select supplier 1). If it's a party for adults, or you just want to do something a little more creative, I would suggest creating a tablescape based on one of the locations in the movies. 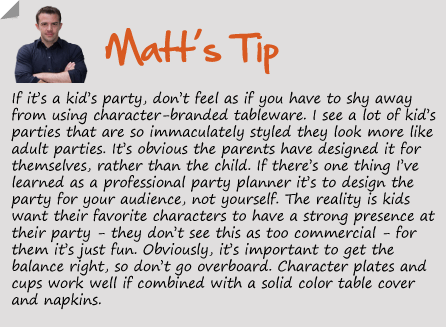 To bring these tablescapes to life, you'll need to incorporate a few Star Wars party decorations, figures, models, toys or props. 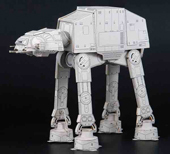 So start by thinking about what you already have access to (ie, from your child's toy collection) or what you can pick up cheaply online to incorporate into these Star Wars party ideas. 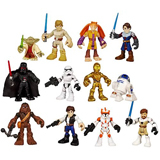 Tip: Look for the Galactic Heroes range of mini Star Wars figures. You can pick these up for around $10 for a pack of two figures. Remember, if do have to buy one or two toys to use as props, they don't have to be the original Harbro Star Wars merchandise figures (which can be quite expensive). 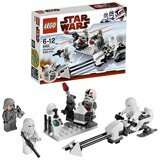 Instead use modelling kits, Lego Star Wars figures, plush toys, cake decorations, and miniature toys. 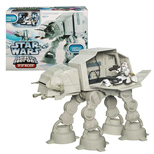 Click here and select supplier 3 for cost effective options including Galactic Heroes (below left), plush toys (below center), and Lego vehicles (below right). 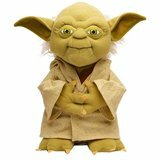 To theme your table as Yoda's home (below from Episode V: The Empire Strikes Back) use a brown tablecloth (select supplier 1) and dress the centre of the table with plants, twigs, and rocks to create a swamp-like scene. Fill a wide shallow dish with a thick green liquid (make a green vegetable smoothie for this) to look like swamp water and dress around the rim with moss and leaves to hide the bowl. 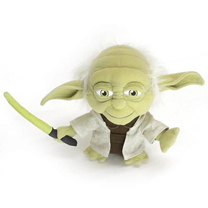 For a special effect add one of these mini fog / mist makers (select supplier 3) so that smoke drifts over the tabletop, then use a cheap Yoda plush toy as a centerpiece (select supplier 3). Pick up an X-Wing fighter (select supplier 3), have this sticking out of the swamp as if it's crashed, and arrange an R2D2 or Luke Skywalker figure around the edge of the swamp. 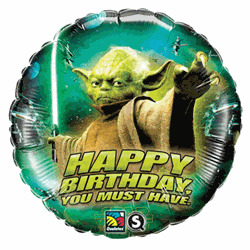 If you chose the Dagobah Swamp theme, use a mix of brown and green plates, cups, and napkins (select supplier 1) to compliment these Star Wars party ideas. Use a sandy colored tablecloth (supplier 1) then sprinkle golden breadcrumbs / sugar down the centre of the table to look like sand (or create the tablescape in a long shallow planter if you prefer). 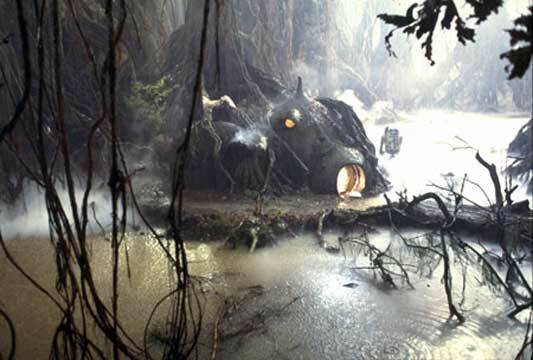 Add a few sandy colored rocks and pebbles, or use crusty bread rolls as the dome shaped houses that Luke grew up in (below from Episode IV: A New Hope). 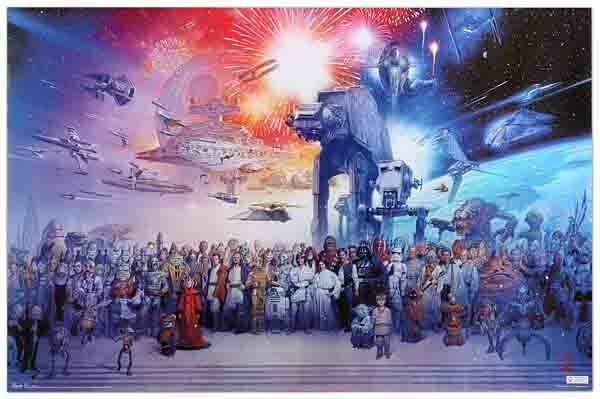 Then add a few figures (supplier 3) such as Luke, R2D2, C3PO, or Jawas to complete the theme. 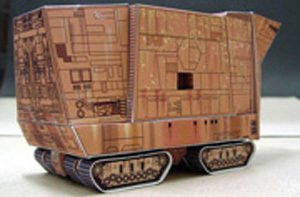 Shunichi Makino, a Japanese designer and paper-craft fan has created some amazing replicas of Star Wars space crafts, such as this Jawa Sand Crawler (below left). 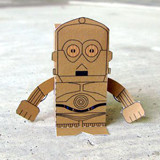 You can download free templates from his site to make your own like this one. 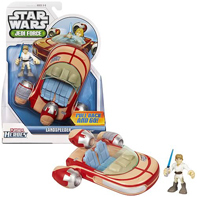 Alternatively, you can pick up this Landspeeder with Luke Skywalker figure (select supplier 3) from Episode IV (below right) quite cheaply and use this to dress your tablescape. If you go for this Tatooine theme, use a mix of sandy yellow / beige and brown napkins, plates, and cups (supplier 1) to compliment these Star Wars party ideas. 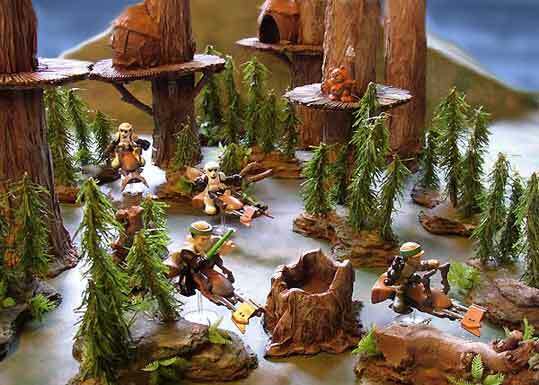 Check out this amazing model of the forest moon of Endor (home of the Ewoks) from Episode VI: Return of the Jedi (below, from Ironhands). 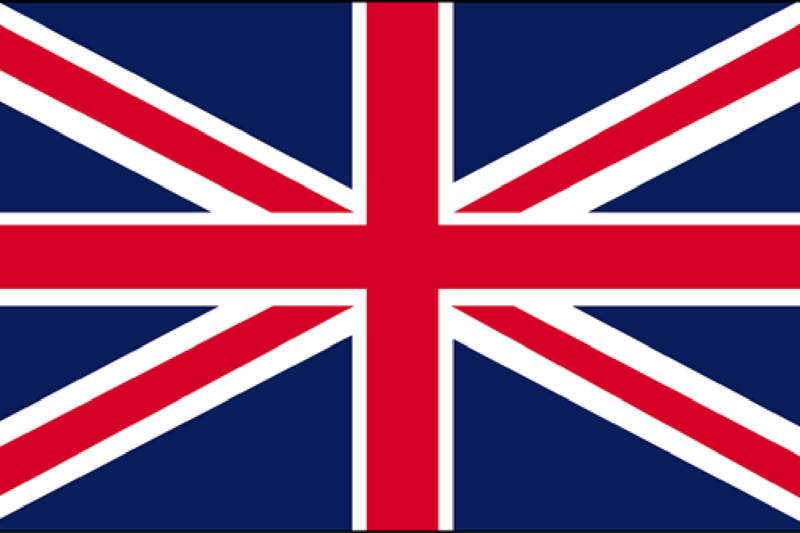 I'm not suggesting you go to such detail but you could pick up some great tips from this site to create a more simple version. For example, the large trees in the pictures are just plastic pipes covered with crinkled brown paper, the small trees are just branches or artificial Christmas trees, and the huts are large plastic Easter eggs covered in the same brown paper with some fake fur matted down to form the thatched roof. Mix a few of these with some bark, leaves, grass, and rocks, arrange on a green or brown tablecloth (supplier 1). 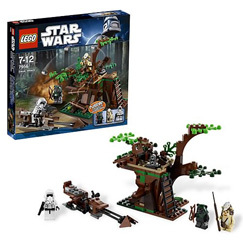 Alternatively, if you're not the arts and crafts type, you can pick up this cheap Lego Ewok Playset (supplier 3) to dress your tablescape. 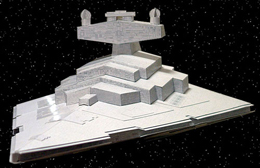 Add some Star Wars action figures (you can get a free template for this model AT ST Scoutwalker, above right, also by Shunichi Makino) and you have your Endor tablescape. 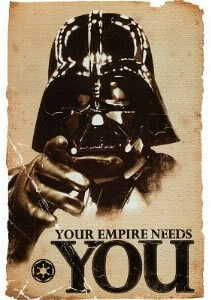 If you can't get hold of any Ewoks just use gummi bears dipped in chocolate. If you chose this Endor theme, use a mix of green and brown cups, plates and napkins (supplier 1) to compliment these Star Wars party ideas. Here's another example (below, from Ironhands) for inspiration. 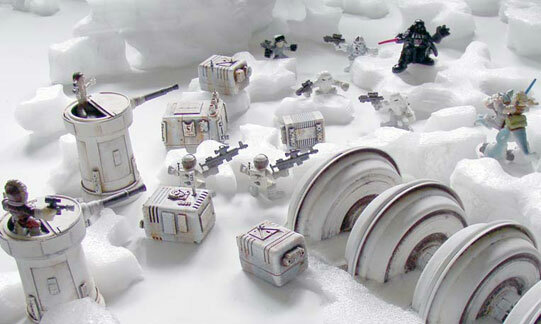 To create the rebel base on the ice planet of Hoth (from Episode V: The Empire Strikes Back) use a white table cloth (supplier 1) and cover with a snow blanket and sprinkles of decorating snow (select supplier 1). 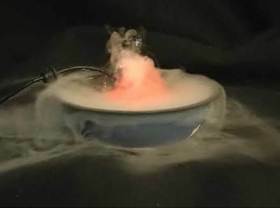 Then use chunks of polystyrene packing foam (the type used for packaging computers) to create chunks of ice, like in the photo below. The Shield Generator (made from plastic flowerpot trays sprayed white) and Gun Turrets (base = Play-doh container, turret = Parmesan cheese lids, and cannon = marker pens) in the pictures are also surprisingly easy to make, so you might want to try your hand at these. 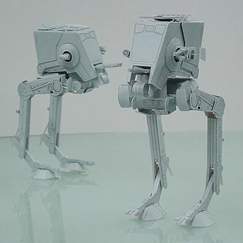 Add a couple of action figures and get the free template for an AT AT Walker (below left, by Shunichi Makino) and you're good to go. If you're not an arts and crafts person and don't fancy trying to make the models yourself, you can pick up a few Hoth themed toys (select supplier 3) here quite cheaply (below center and right). If you choose this Hoth theme, use a mix of white and grey plates, cups, and napkins (supplier 1) to compliment the Star Wars party ideas. 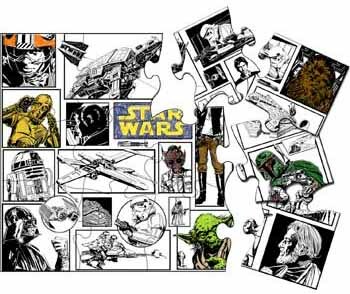 Whichever one of the tablescape ideas you create for your Star Wars birthday party, use the free downloadable template from Toy-a-Day to assemble one of these paper Star Wars figures and use a different one to identify each person's place setting around the table. One way to give your party a professional feel is to make sure all the chairs have a uniform look. Often, if you're using mismatched chairs or chairs that don't fit with the theme of your party they can really clash and it detracts from the overall aesthetic. 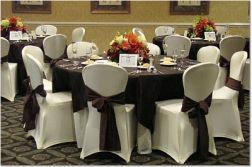 Matching the chairs with the table linen is one of the reasons the table styling always looks better at professional weddings or events. 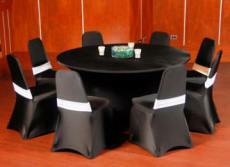 If budget permits, use these simple stretch fabric chair covers (select supplier 2) which you can pick up for approx $7 each in black or white. 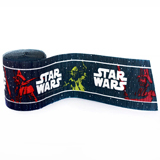 You can then add a splash of color that compliments your Star Wars party ideas by adding a colored sash (below left) or band (below right). 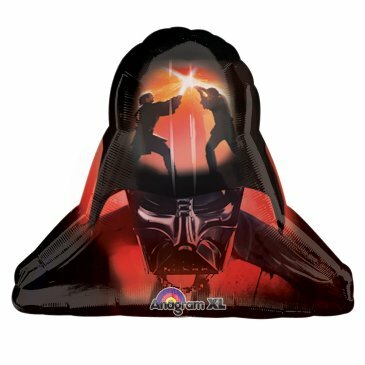 Fortunately there are lots of Star Wars party decorations available for a Star Wars party theme. I didn't have space to feature all the decorations available, so to see a full range of supplies use the quick links below. These suppliers have the best range and between them they have something for all budgets. First impressions are important so I always think it's a good idea to have some sort of feature to welcome guests as they arrive, whether it's a yard sign, personalized banner over the front door (select supplier 1), or a parent or sibling dressed in character to greet them. 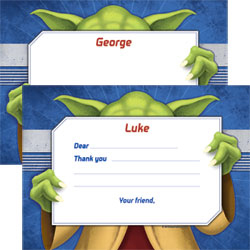 If budget permits, get a Star Wars character stand-up (supplier 1) of say a Clonetrooper or another character and position this at the front door. These are life-size so they make quite an impression and you can use them later for photo ops. 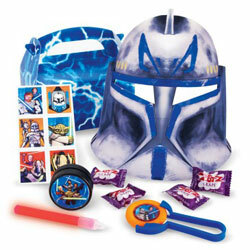 Failing that, have a sibling or parent dress up as a Boba Fett (below, second left), Darth Vader, or a Clonetrooper. 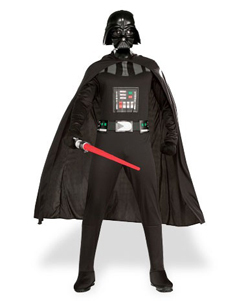 See here for a selection of Star Wars costumes. 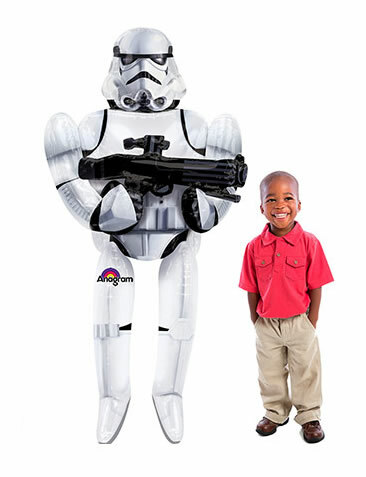 Another option is to use a large airwalker balloon (select supplier 1) or this Vertical Stormtrooper Poster (below right, here for UK) on the front door. 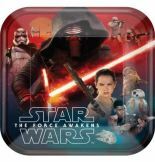 Music is a key part of the Star Wars films, so download the main theme tune, put it on repeat on your ipod (or CD player) and plug in a speaker. Then position the speaker near the front door so that as guests arrive they are greeted by the famous theme tune. 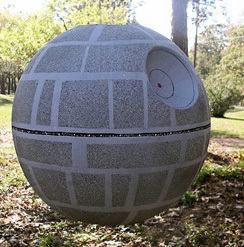 This will really bring these Star Wars party ideas to life. 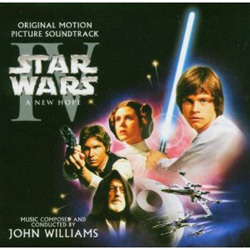 Similarly there's the famous Cantina Band music being played in the bar on Tatooine in Episode IV A New Hope. You could have this playing while guests arrive, or isolated around a drinks bar / food table. 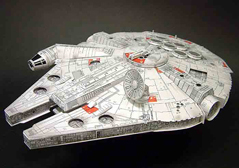 Shunichi Makino, a Japanese designer and paper-craft fan has created some amazing replicas of Star Wars space crafts, such as the ones below. You can download a series of free color templates from his website to create your own just like these, complete with photo instructions for how to assemble. 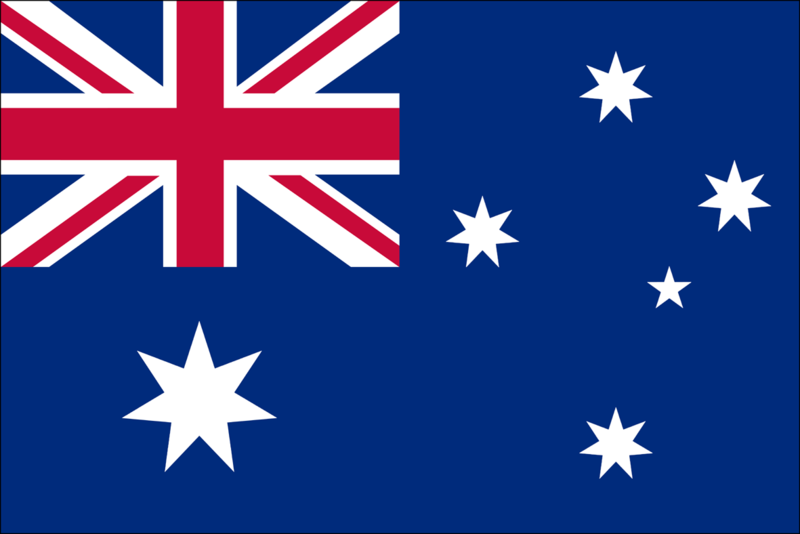 Don't be put off by the fact the site is in Japanese, just click on the button under whichever ship you want and download PDF's of the templates along with the photo / diagram-based instructions. 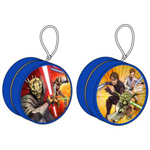 Once assembled, hang from the ceiling as Star Wars party decorations. 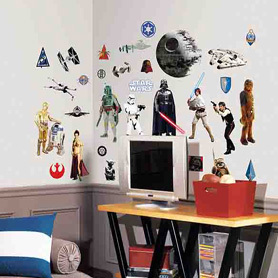 Star Wars removable wall decals (select supplier 1) are a great way to theme a party. You can apply them to the walls where the party is taking place, and they just peel off afterwards. Plus the guest of honor can decorate their bedroom with them afterwards. 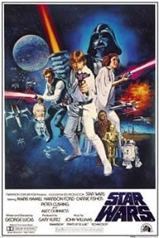 There are loads of great Star Wars posters (select supplier 3), including the original movie posters, available which are a cheap and easy way to decorate larger areas. Make your own paper mâché Death Star like this one (below left) by Joey Lopez who covered a 48 inch beach ball. Or this one (below right, by Philip Jones). 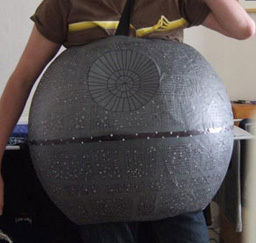 He gives step by step instructions for how to make it as a wearable Halloween costume, but because of its size I think it would make a really impressive display to hang above the dining table as one of your Star Wars party ideas. Just adapt the instructions accordingly. 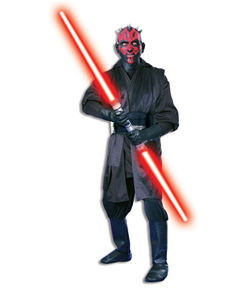 Get a parent to dress up in a Darth Vader or Darth Maul costume and make an entrance later on in the party after they've completed their Jedi training (see Star Wars Party Games and Activities). 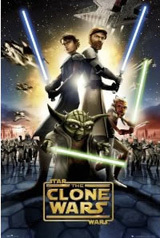 Don't forget to download the Imperial March (Darth Vader theme) music and play this beforehand for a dramatic build up. 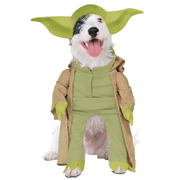 There are also lots of great costumes for kids if you want to let your child dress up for their party. 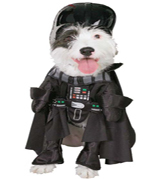 Also, if you have a dog, check out these cute canine costumes so you can have a mini Darth Vader, Yoda or Princess Leia running around the party. 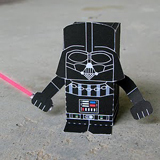 See the Star Wars Party Games page for a list of Star Wars party ideas and activities such as these below. When it comes to party favors, it often works out cheaper to buy these pre-filled favor boxes (below left). 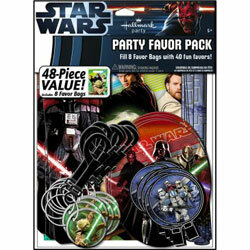 Alternatively, you can pick up this value pack of Star Wars favors (below right). See here for both (select supplier 1). 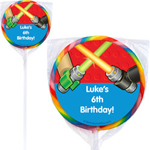 If you prefer to choose your own favors, there are lots of small novelties and toys available, (select supplier 1) such as the Yo-Yo's, personalized buttons and lollipops below. See here for a full range. 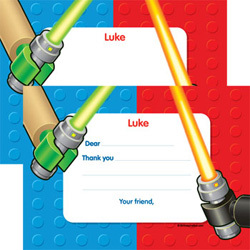 For thank you notes in keeping with these Star Wars party ideas, you can pick up a pack of ready made ones (select supplier 1). Alternatively, you can have personalized ones printed, such as the ones below. 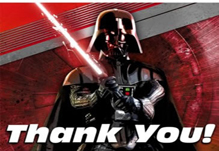 If you found these Star Wars party ideas helpful please assist me in promoting my website by using the Facebook and/or Twitter buttons below to share this page with your friends. Alternatively, you can use the "Enjoy this page?" 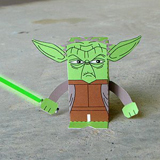 link underneath to get the link address for these Star Wars party ideas and paste it into your own site, blog or forum.